Q: How is your window cleaning Sidcup going to bring back the transparency of my panes? Interior window treatment – The technicians will wash stains with ladders and squeegees. Q: Can you polish my panes during unpleasant weather? A: If you spot dim clouds on the day of your appointment, don't panic. The window cleaners in Sidcup can still perform the service provided they're facing a light shower. However, in the event of a rainstorm, we will kindly ask you to put off your appointment to avoid any injuries. Q: Can I assist the cleaners in any way? A: Yes, you can! The cleaning team will need a free parking slot in close proximity to your building (30 metres or less) and on the same side of your windows. Q: Do I need to meet up with the experts in person? A: It's no problem for the specialists to rinse the outer surfaces of your panes as long as they are free to walk past your front gates. And if smudges have landed on your internal surfaces as well, just inform us and we'll perform a free key pick-up and delivery. A: We will immediately inform you about the cause of the expert's delay and notify you once he parks near your property. A: Yes we're qualified to clean any type of pane or window component. What's more, every PVC or UPVC frame or sill will be treated free of charge! A: Yes, we can, but we'll only rinse the external surfaces with the water-fed rod. For the last ten years, our window cleaning Sidcup service has always brought efficient results at the most affordable prices in your district. You can browse our prices in our convenient price table below. With window cleaning in Sidcup, we can better the appeal of your premises even if it brushes the clouds above. Let's look at what you'll get once you go for our flexible service. For exterior window rinsing, the Sidcup window cleaners will deploy a expandable water-fed pole. A water pump inside the team's van will deliver filtrated water up the hose and out of a brush-head extension. The water, together with the brush-head, will remove any traces of filth from the casements of any four-storey domain. With rope access window washing, the specialists will use reliable climbing gear to reach even the topmost storeys in your commersial or residential property. We have all necessary COSHH documentation and risk appraisal reports and can send them to you in a moment's notice. Also, we regularly check the cleaning gear to ensure that your session will go without a hitch. And to scrub every inside corner of your window façade, the experienced team will use the classic sponge and ladder cleaning approach. 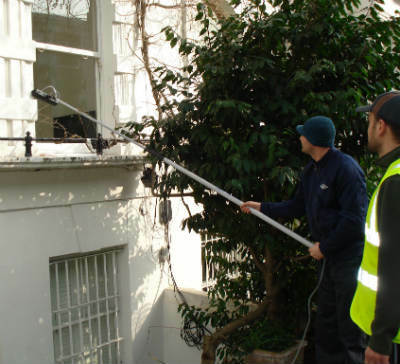 As we obtained more and more positive responses from our clients, the demand for window cleaning in Sidcup has noticeably skyrocketed in neighbouring areas. You can find the regions we've covered in the list below. Alternatively, get a free instant quote or order affordable window cleaning services Sidcup SE9 online, through our web site.